The six parks at Arista are all carefully planned and each has a distinctive character. Arista Park is ‘the gathering place’ for visitors and residents of Arista. 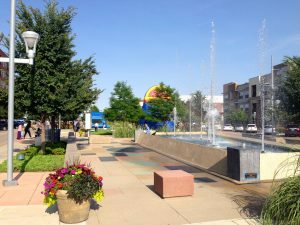 The Park is a two-block main centerpiece to Arista Place, representing a modern interpretation of a traditional town square incorporating a performing water feature, outdoor fireplace, and festival banners. Various levels create spaces for gatherings of different sizes ranging from farmer’s markets and concerts to places for quiet conversations. WI-FI: Enjoy free wireless communication in Arista Park, from the 1stBank Center to the aloft Hotel. Available to all Arista office tenants, residents and guests. So, relax in the park and enjoy your music, check email, and browse the web…on us! Red Point Ridge is the social park for residents of Arista. 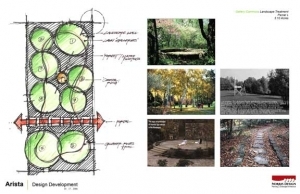 The landscape architectural concept is derived from the geographic arrangement of the state. A low seatwall replicates the plan view of the Continental Divide within Colorado. A climbing wall is a scale representation of the Continental Divide from the Eisenhower Tunnel to the Moffat Tunnel. The landscape within the park represents the various ecosystems in the state from the mountains to the high plains. The sloping topography of the park will provide opportunities for viewing outdoor movies. Other traditional park elements include a basketball court, playground, shelter and gardens. Shepsfield incorporates a dog park and a large open lawn. 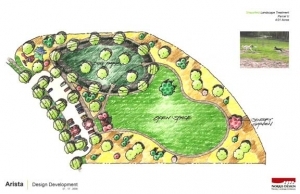 The lawn will be used for passive recreation such as picnicking or non-organized sports and is supported by a playground and shelter. The name is a memorial to the dog that was cared for by the toll booth workers when US-36 was a toll road. Shep one day appeared at the toll booth and the workers cared for him for many years until his death. Shep’s grave is currently located at the Wadsworth interchange. The park is within the flight path for Jefferson County Airport and is designed in the profile of a very famous beagle when viewed from above. In addition to providing regional detention for Arista, Terrace Ponds also provides many recreational opportunities. 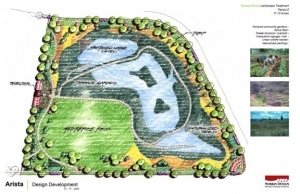 These include a large field for organized sports and community gardens that terrace down the hillside. A large loop trail meanders along the ponds and among the created wetlands. Trees, shrubs and grasses will provide food and cover for avian and smaller wildlife species that will inhabit the park. Gallery Commons is an outdoor gallery for the display of public art. The park consists of a series of circular lawns connected by a primitive walk. Trees, shrubs and groundcovers provide the canvas for each gallery. A prairie style council ring is located at the center of the park and a low seatwall bisects the park and points to the geographic center of Colorado. 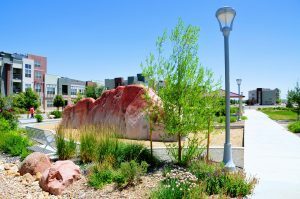 Uptown Park functions primarily as a detention pond, however, a loop trail circles the park providing an additional recreational amenity. The overlook area is a great place to eat lunch and view the wetland plantings, the wildlife and the rest of the Arista project.